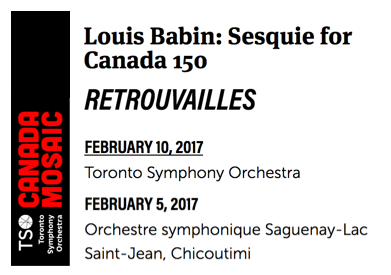 Laval, January 10, 2017 – The world premiere of composer Louis Babin’s new symphonic piece Retrouvailles will be performed in February by the Toronto Symphony Orchestra (TSO), as well as, the Orchestre symphonique du Saguenay-Lac-Saint-Jean (OSSLSJ). This joint commission by both orchestras is part of the Canada Mosaic project which fits in the celebration of Canada’s 150th anniversary all around the country. The fanfare composed by Louis Babin will serve as opening piece to two concerts, on February 5th in Chicoutimi, and on February 10th in Toronto. Retrouvailles calls for celebration and sharing amongst friends and family. Through his music, composer Louis Babin wishes to remind us that, “whatever our origins and our beliefs are, it is by acknowledging our differences and uniting our talents that we can all flourish, and anticipate with such joy our Retrouvailles (reunion).” You can listen to a MIDI version on Louis Babin’s new website. The ambitious musical project Canada Mosaic is conducted by the Toronto Symphony Orchestra, teaming up with orchestras and ensembles across the country for an unprecedented pan-Canadian celebration. Over 40 new works – including a number of pieces known as “Sesquies” – have been commissioned and will be performed all around Canada in 2017.